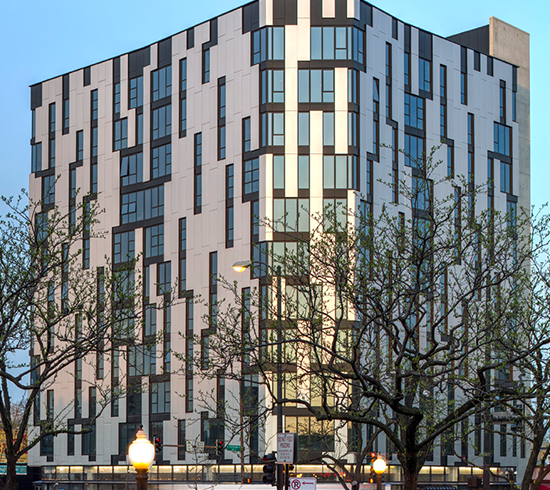 The design-construction team for 1611 West Division had to get the project completed quickly while sticking to the goal of achieving LEED Silver certification. There were many ways to achieve those goals. However, the architect wanted the envelope to create a sense of movement that would identify with the character and individuality of the people living in this progressive community. But the designers wanted this building to be a significant structure in a Chicago area filled with distinctive architecture. They had to find exterior cladding that could go up quickly, provide high R-values, and give 1611 West Division an appearance that would become a landmark. The Solution: BENCHMARK by Kingspan Designwall™ 1000 insulated metal panels were specified to create the building’s envelope. The panels were arranged vertically across horizontal floor slabs and folded around the building almost like textile. By installing them in a staggered pattern, each unit has an individualistic quality and yet the entire structure is woven together seamlessly. The Designwall panel created a wall system that offers impressive curb appeal while providing excellent thermal performance. Today 1611 West Division offers much that is needed from a mixed-used, high-density urban building.